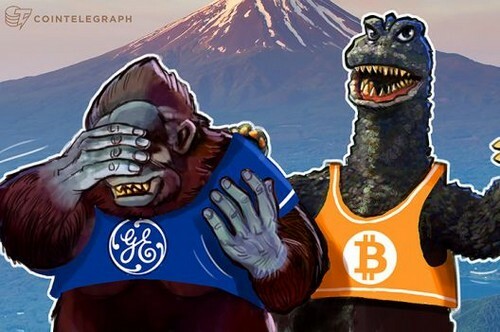 Bitcoin has surpassed the market cap of General Electric, which was once the largest company in the world, by $30 bln. At $160 billion, Bitcoin’s market cap just passed GE’s. GE, with a $123 bln annual revenue and 295,000 employees globally, still remains as a leading US-based conglomerate. In July of 2016, the market valuation of GE briefly surpassed $300 bln, nearing the market cap of other major firms like JPMorgan. But, since 2015, GE has struggled, as its market cap fell by nearly 50 percent. Meanwhile, since 2015, the market cap of Bitcoin has increased from $2.5 bln to $185 bln, by 74-fold. As a store of value and a digital currency, the market valuation of Bitcoin should rather be compared to other assets, stores of value and currencies such as gold and reserve currencies. But, it is important to acknowledge the rapid growth rate of Bitcoin in comparison to companies in leading industries because the transformation Bitcoin has brought upon the finance industry has been truly impactful. Bitcoin has surpassed leading currencies on the M1 index as well this year. This week for instance, the market valuation of Bitcoin surpassed the total money supply of the British pound. As Bitcoin price enters the $45,000 range and the market cap of the cryptocurrency achieves $1 tln, analysts will begin to compare Bitcoin with conventional safe haven assets such as gold. Currently, the entire Bitcoin market is about three percent of the multi-trillion dollar gold market. But, if Bitcoin continues to increase in value and reaches $40,000 by the end of 2018 as noted by Novogratz, it will soon be able to compete against the gold market and other stores of value such as reserve currencies.